The taxpaying public are enabling politicians to keep an elitist money system on the road and the only way it can stay on the road is on the personal debt of the taxpaying public. To change this system would take the combined agreements of all nations which use it because by unilateral change, the dealers, spivs and elite rich would simply move to another market and therefore a country would soon become bankrupt if taking lone measures. The people can change this system for their own national interest simply by refusing debt and looking to spend what money they do have, on products which are manufactured nationally.......like Japan did in the 80's. The task to change the system is only in the hands of the consumer as no politician has the ability to engineer a global agreement on this, especially since America is already dead set against it as it would never ameliorate itself to a social position which forced it to put people before the pursuit of money, et al The American Dream. We have no hope to change it except as individuals and the only way we can be free is to ignore its temptations by refusing debt and looking to buy British goods. If on the other hand people are happy to be in debt, see the cost of living spiralling, grab everything they can whilst millions have nothing because they are left out of this system, and they are happy that their future generation will have no choice but to go to war to increase the prosperity of others and to maintain the growth which is essential to their economic survival, whilst rich elite laugh up their sleeves from their tax havens, then fine.....get on with it. Meanwhile, I'll be turning every asset I have into self perpetuating income rather than something which will eventually hold no value when the bubble bursts at the point there's that much debt in the world that no one can have any more. Because when that happens, people will again see that their assets are actually worthless pieces of junk without buyers. Hence, we have mass migration and increasing populations to increase the consumer base and not the slightest consideration for anything other than the ideals to keep the broken money barrow on the road and the need for millions of economic slaves to pull it along. Personal indebtedness will continue to grow unless present monetarist policies and free market economies are globally brought to heel. Yes! 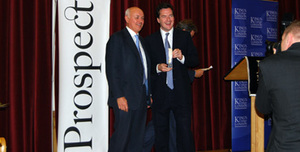 Many congratulations to IDS and his team! Rugfish: you make good points. But it is not only the taxpayer who suffers; it is the pensioners and the sick and the jobless who face ever-more desperate and straightened circumstances. According to a report out today, pensioners have been hit by inflation 6% + more than their working counterparts. People on the dole - whether 'worthy' or 'unworthy' (and those are very loaded phrases indeed) are struggling to live on £60 a week. Our armed forces are dying because of inadequate equipment. 20% of our children are illiterate. 10% of ex-servicemen make up the prison and homeless population. And yet this government has tried to screw those on the lowest incomes out of any basic tax rates. It has increased the gap between the classes and possibility for social mobility by cutting out grammar and faith schools and imposing an Americanized education upon the young (and the US system is not particularly wonderful). If we cannot spare a few pounds for those at the bottom of the pyramid who *might*, given the chance - be it through good education or vocational training, or feeling as though they're worthwhile rather than a waste of oxygen because they're not part of the economy - be valuable contributors to society, we are nothing. George Bush last week tried to cut $14 billion of health, education, welfare and cancer research and then turned round and asked the Senate for 50x that amount to bail out Wall Street. Let not us follow his example. Lack of monetarism, or certainly a complete abandonment in the control of the money supply by one G Brown is at the root of the current crisis. Giving the junkie banks the narcotic they require in vast quantities at a knock down price is bound to end in tears. Additionally free markets work. Or better defined as freedom and free exchange, is the equally bound certain way to create wealth. But free exchange and free peoples require certain certaintities to work well, and for these we create government to look after these for us. The main conditions are the the right to enjoy private property, government as umpire not player, sound money, the rule of common law. Using these and ensuring that monopolies do not arise will secure for us a framework that creates wealth without any state 'help'. It's is not that the state allows us to do things, it is the other way about and the state is our servant. Under the current government this has been completely forgotten and ignored and the banking crisis has been precipitated by unsound money and unsound supervision of the free market process. Note, I specifically did not say 'regulation' as that word assumes that a bureaucrat knows better how to effect any transaction between free agents than the agents themselves. This is nonsense. ....oh and Rugfish, one more thing. One of the prime factors that precipitated the 1929 recession was protectionism. You advocate this by recommending buying national products. In fact we need to keep international genuinely free trade going at all costs. The current fad for 'national champions' and other jingoistic statememnts will certainly lead to global recession. We must encourage all countries to trade freely with one another each doing what they are best at. If we do not do this we may just suffer mass unemployment but Chinese clothes factory workers would more than likely starve to death. Well said Lola and you too Mara. I don't actually disagree with either of you in fact. Yes Mara, there's some speech somewhere which happens to be along the lines that a society can only measure itself against the poorest of its people, and I agree with that. The problem in regards to pensioners as I see it, is that the government took away their pension growth and the state makes no real allowance under IHT as to how such money could be used to the benefit of the poor in society too. They think IHT just applies to rich folk but they're wrong. Life assurances these days pay out quite handsomely for instance against a decent pension. ( If people thought it worthwhile to save in one of they hadn't been robbed ) - add that and other savings and the family home together for an average family and it starts to add up....if the assets are preserved not weakened by government policies. i.e. The low paid would / could begin to gain richer lives IF IHT was not used as a death 'penalty'. As for Mara, I'm talking about buying British but of course we'd have to actually make things to do that. As is stands now we make very little and thus some have homes full of IKEA crap, and BMW's ( on tick ). It makes me wonder quite a bit also why we are not actually LEADING the world in producing environmentally safe cars....we do it with public service vehicles and the technology is there for private, so why leave it to the French ? Same with these nuclear plants. Why SELL the damn job to France when we can do it here ? Oh, it's skills isn't it. Maybe because no one can afford to take degrees in engineering these days has something to do with it eh ? You see, I'm not really about protectinism as much as I'm about having a fair crack of the whip. Like paying our own doctors to do jobs instead of advertising them in Africa and India for example, as well as nurses which forgot the hospitals need to be clean. Or teachers who actually know things as opposed to filling a space behind a desk because they're good at following orders and checking boxes ? The list is endless here I'm sure you're aware, of how pathetic this government is in any measure of free enterprise and considered social thinking. Lastly, the finance industry is going nowhere as long as it has a bureaucratic statutory body watching every move it makes, and as for mortgages, that's a problem in addition to the fact people can't afford them because they have no skilled job with high enough wages, and because lender are forced to place ridiculously high arrangement fees on a mortgage in order to help pay for the costs they have of following FSA regulation and meeting their fines. This is all up to David Cameron to get sorted out of course so I'm hoping we can all do that soon. Meanwhile, I heard Brown say at PMQ's, that HE took the several self regulators into ONE body and called that a "good" decision. He knows absolutely NOTHING of how it is actually made to work better with LESS regulation in place and he knows nothing of the problems CAUSED by his stupid regulations because he takes no blame and doesn't listen. If I was sat facing him I could rip him to shreds so I wonder why "WE" are not doing so.